Every year in May UCSD hosts the Sun God Festival, which for most students is an excuse to get drunk and skip class. 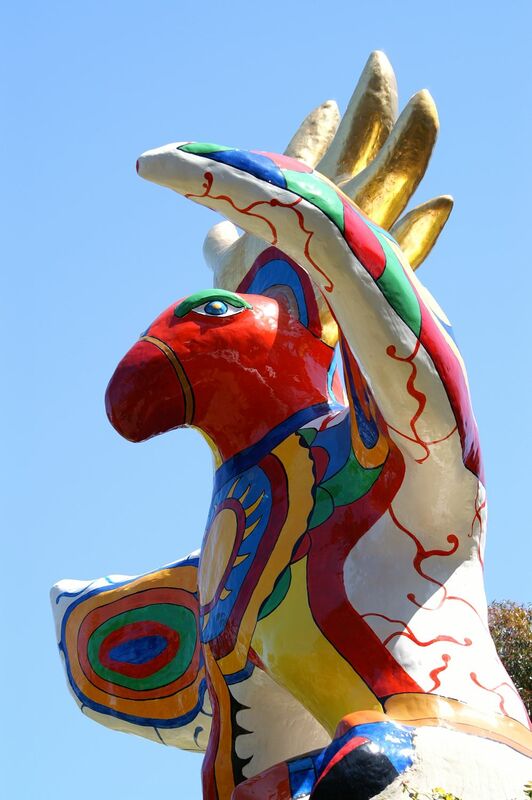 It is held on the lawn surrounding the Sun God, a large bird-like statue in the middle of campus. There are many student organizations that set up tables & other activities, such as inflatable sumo wrestling or pixie bike jumping. Usually, the controversial student publication, The Koala (careful, if you scroll too far down you won’t like what you see), has some kind of water-based activity. One year ago it was a slip ‘n’ slide, and this year it was a slip ‘n’ slide too, but this time with a chute off a small embankment. All of this, I suppose, is in tribute to, or because of the statue for which the festival is named. After all, the artist who made it was French, until 2002, when she died. And we all know how those French are, très fou. Well, maybe not. What’s not to like about this entry in the Stuart Collection? It was the first item in the collection. It’s colorful, simple, vibrant, and not hard to interpret. 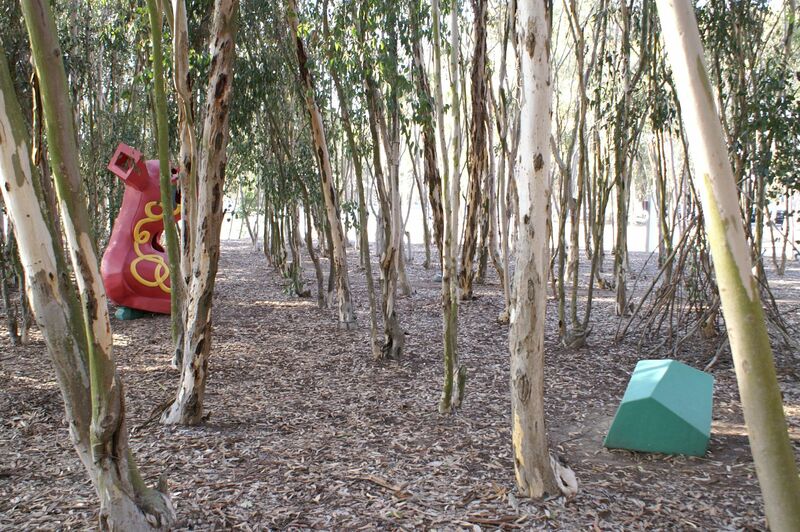 Perhaps out of all the items in the collection, this is the one UCSD students actually pay attention to most. And that’s saying something, if you’ve ever met an UCSD undergraduate. UNDA, by Ian Hamilton Finlay (1987) is in the vein of the La Jolla Project, another Stuart Collection item. This time, the stone blocks are smaller and fewer in number. These stones are English limestone and have the latin word for ‘wave’ carved into them, unda. To be more precise, the letters are carved out of order with a s-like shape included which transposes the letters to put them back in order to spell unda (see the sixth item on this list of editorial symbols). According to the official page on this item (linked above) the wave moves through the letters like the waves in the nearby ocean, making a literary wave… or something. 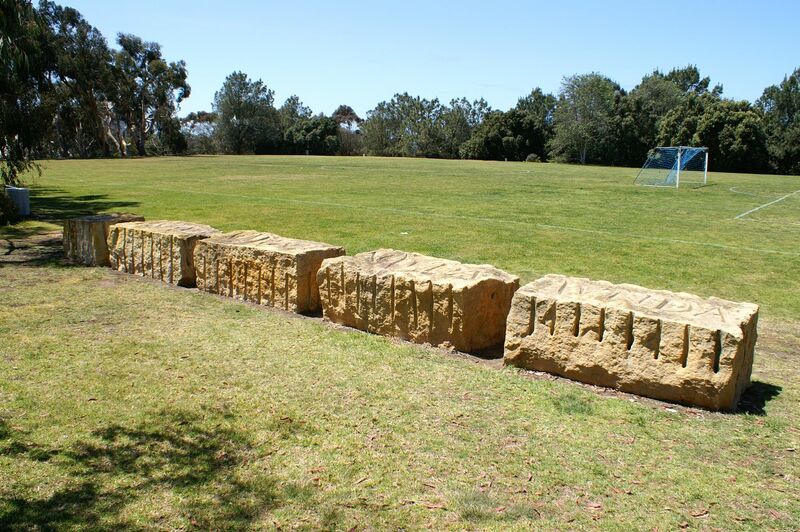 It seems to me that since the La Jolla Project had been installed three years before this item, putting plain blocks out on a lawn would have been plagiarism. Finlay probably thought to himself, “I’ve got all these bloody blocks of limestone, but some other bloke already did art with stone blocks. Let’s put some latin on them… and perhaps put it in the wrong order, like the word has been hit by a wave. No! Wait! I’ve got it!” And the result is what we see today. This entry in the Stuart Collection is a good one, not a great one nor a poor one. I’m always skeptical of art that I feel is forced (waves upon waves upon undas, bah!) but this is okay despite that. The stone has a nice texture which I’m sure changes by the year due to weathering. The stones were cut roughly so they aren’t square and perfect like the La Jolla Project. The stone has character which the unda doesn’t ruin. It’s worth your time to see. 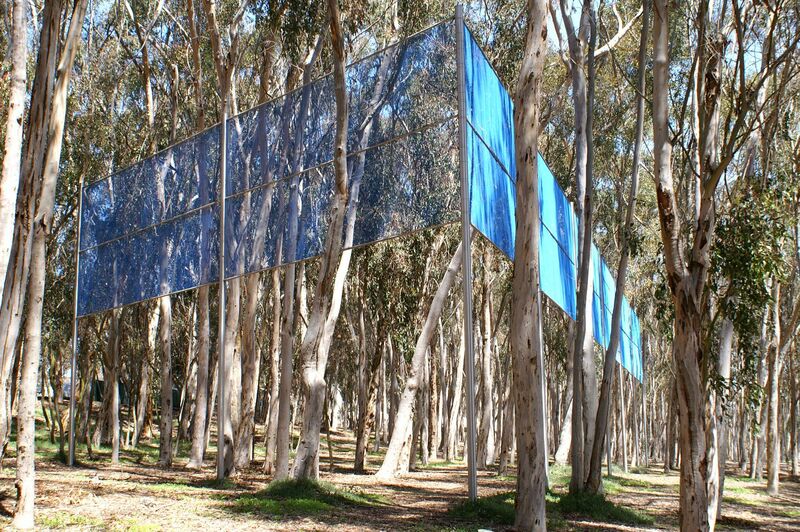 In my opinion, Two Running Violet V Forms by Robert Irwin (1983), is the most easily describable entry in the Stuart Collection. Put simply, it is blue chain link fence raised thirty feet off the ground, arranged in two V shapes, set in the eucalyptus grove in the middle of campus. There’s really not much more to say about it. Um, wait it also has… nope, um… uh, yeah. That’s really all there is to this art. Oh, okay, I do have something to say about this ‘art.’ A couple things. First, this is another entry in the list of Stuart Collection art I could have done myself. That’s not a good thing. 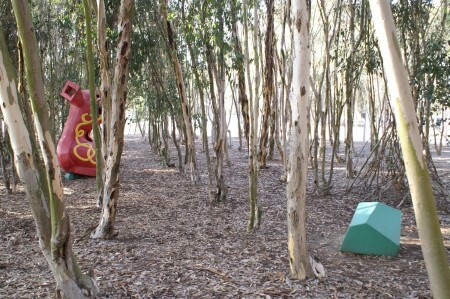 Second, at least this art is easily avoidable, being in a part of campus I rarely go. If I do go there, I just have to keep my eyes low and I go right through it unmolested. Save your time and see something else while on campus. Third, while describing it is easy, understanding it isn’t. Do you understand it? If so, can you help a brother out? I promise that upcoming Stuart Collection posts will be more interesting! I managed to go by Something Pacific (by Nam June Paik in 1986) numerous times before I ever noticed it. In fact, the first time I expressly looked for it, I couldn’t find it. Its entirety is a few foot-high statues watching concrete-filled 1950s televisions, placed in on a lawn. It is a fairly unimpressive work, considering that the artist was a video artist. The televisions don’t function. 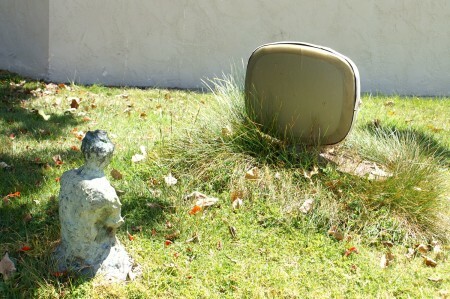 Anyone can put televisions out on a lawn. I’m serious about this. A video artist is worthy due to what he has the televisions show. Using the standards of this work, I could be a paint artist by putting empty cans of paint out in the middle of a lawn. See! Paint cans! On a lawn! I’m a painter! Perhaps the only redeeming quality of this art is that you actually have to slow down to notice it. Overall, this is a sub-par entry in the Stuart Collection, in my opinion.